The modest title of this book belies the wealth of information inside. Hundreds of full-color illustrations depict countless creative solutions that help you make the most of your space to meet your needs. 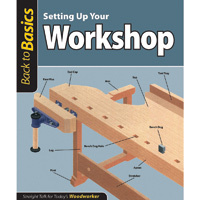 Extensive chapters on shop accessories, inventive work surfaces and clever storage solutions help round out the essentials of building a workbench and locating power tools, and make your shop run as effortlessly as you had dreamed. 152 pages. This entry was posted in Book Reviews, New Products and tagged Book, Setting up Your Workshop by bdks. Bookmark the permalink.